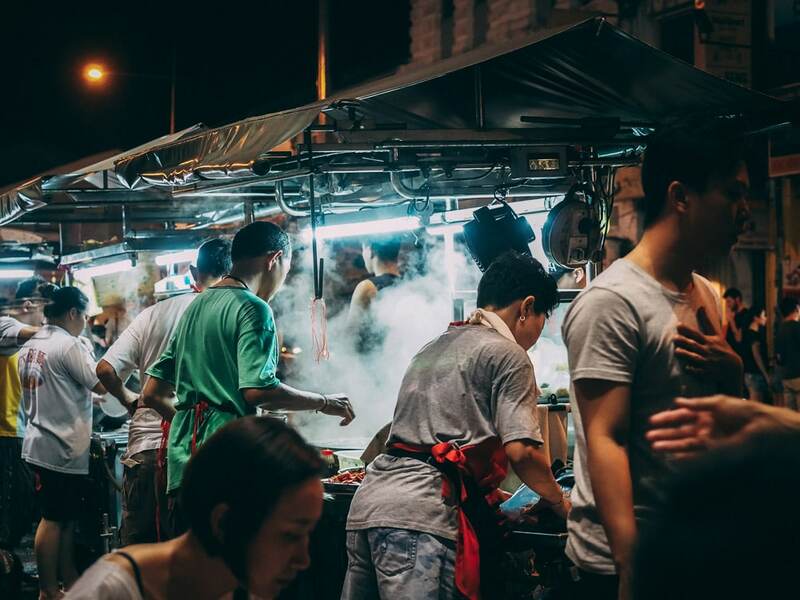 Where to eat in Penang Malaysia is a difficult question to answer as there are so many delicious choices and dishes to try in Penang. We have been to Penang twice and on our last trip, we stayed for 5 weeks. 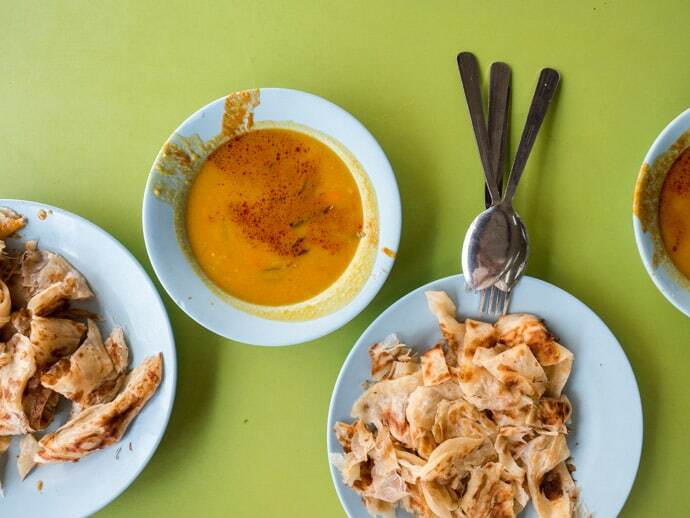 We loved eating our way through Penang all over again, and we think you’ll love it too. 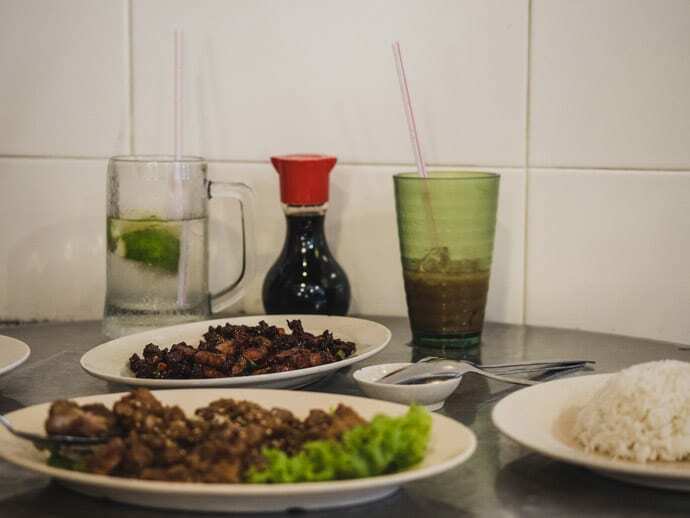 But this is by no means an extensive list of the best dishes and the best places to eat in Penang. 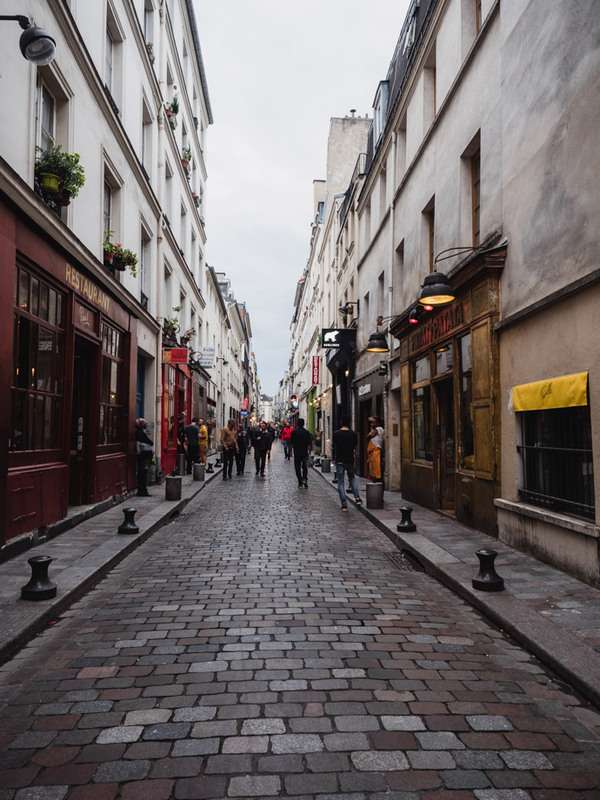 We tried so many amazing places and some places that we didn’t think lived up to the hype (and left those places off). 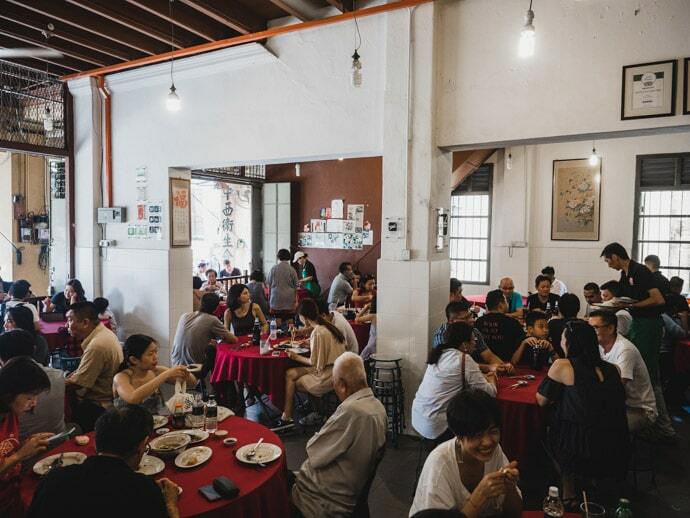 So these are only our favourite picks for where to eat in Penang, and that’s why it’s a shorter list and not all famous eating places in Penang are included. 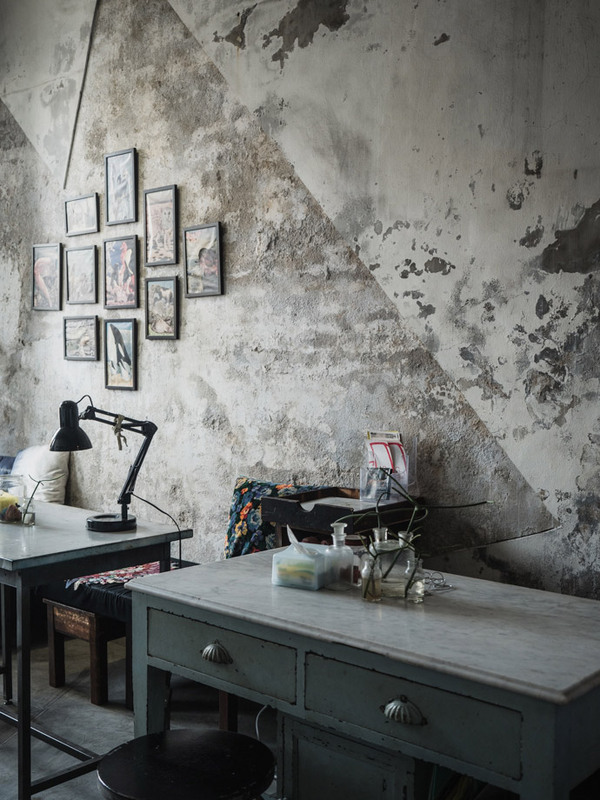 Our list below focuses mainly on where to eat in Penang for local food, but you can also see our posts on the best cafes in Penang and the best healthy restaurants in Penang. 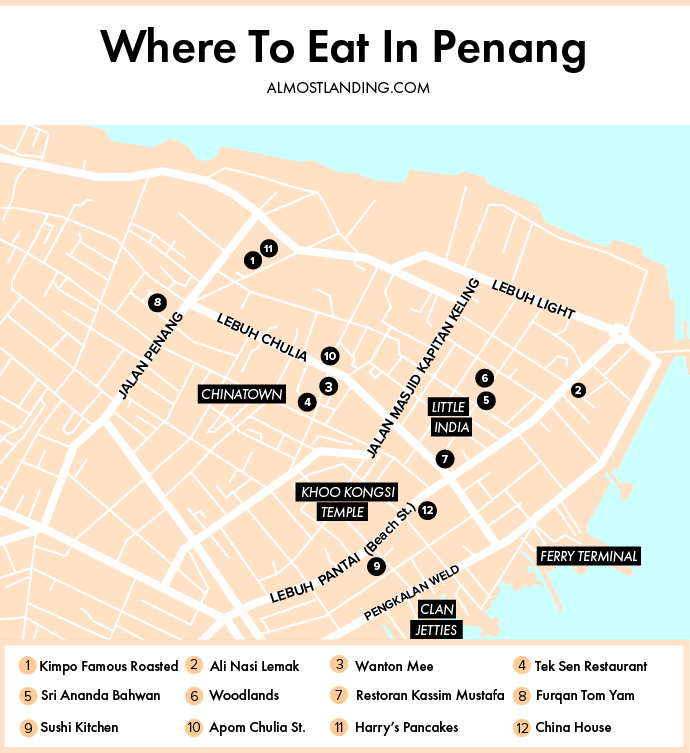 Here is our Penang food map pinpointing all of the best places to eat in Penang. This map is of George Town Penang, as this is where most of our favourite Malaysian dishes were found. 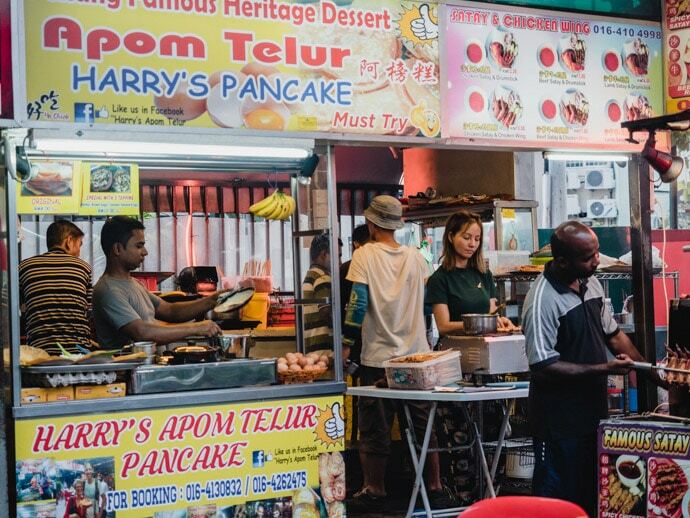 At the end of the post, you can download a printable Penang food map to save to your phone or print out and take with you for your trip to Penang. 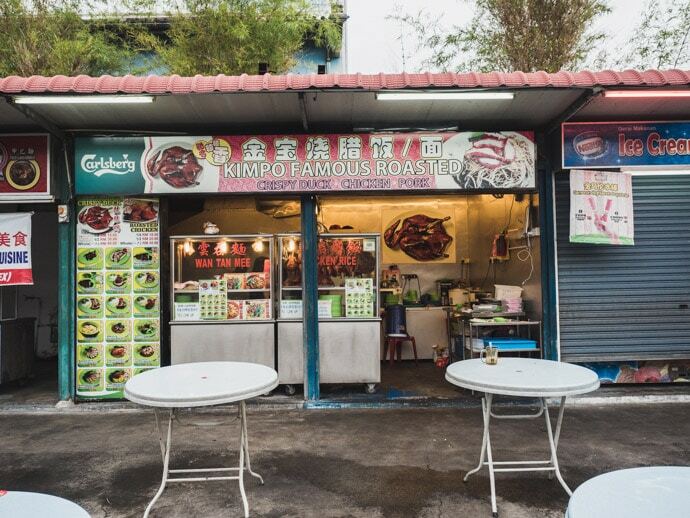 Kimpo Famous Roasted is one of the many stalls at Red Garden Food Paradise Hawker Centre. Here you can get delicious roasted duck with noodles and greens, amongst other dishes. Red Garden Food Paradise opens in the evenings only. 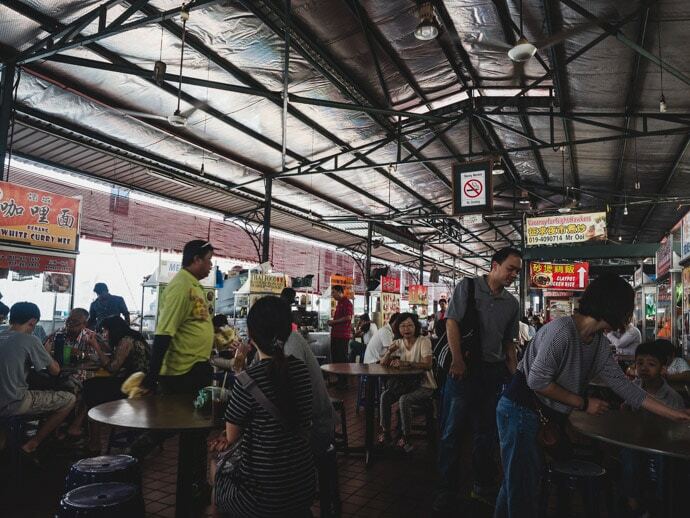 Sri Weld Food Court is near Little India and is a common place for local people working nearby to come for breakfast or lunch. And it became a common place for us too! We loved Ali Nasi Lemak for breakfast. 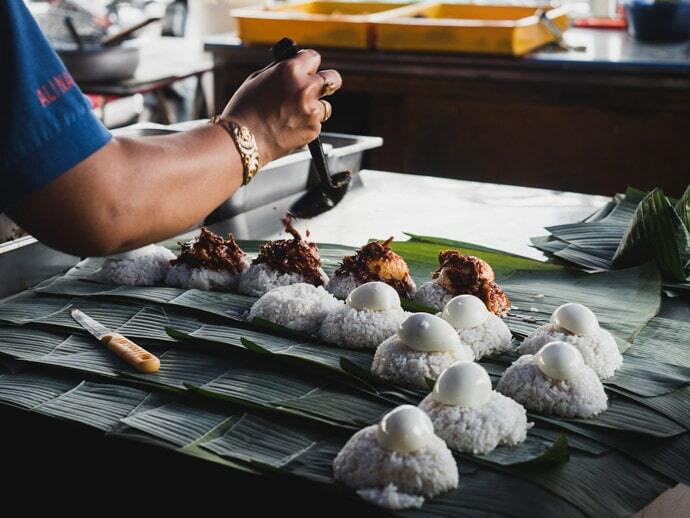 Nasi Lemak is a Malaysian rice dish cooked in coconut milk, ginger and pandan leaf and is served with sambal (spicy chilli sauce) and hard boiled egg, and usually a choice of toppings, such as ikan bilis (anchovies), fish, prawns, chicken. 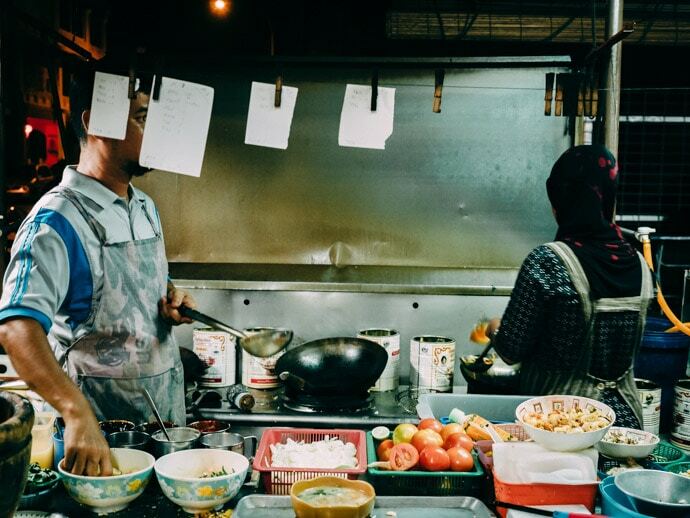 The Penang famous food street, Chulia Street, has a night market with an array of different stalls and stands lining the road with little red plastic chairs and steel round tabletops. The motorbikes buzz pass, the steam and smoke from the cooking fills the streets, and the smells in the air will draw you to your dinner. 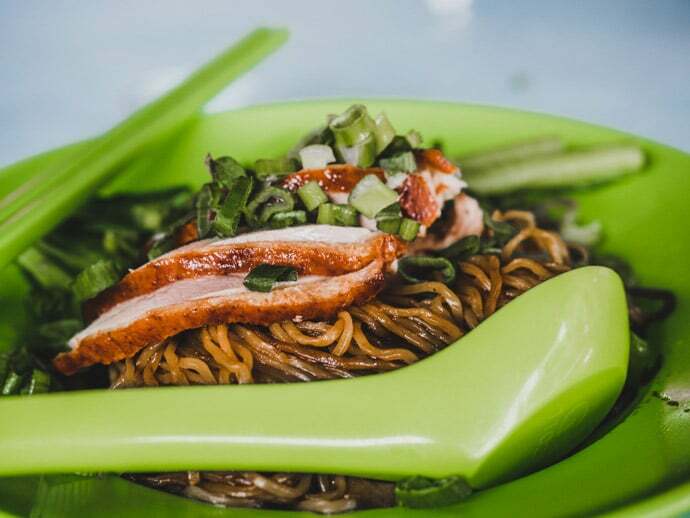 We loved the Wanton Mee stand in particular. 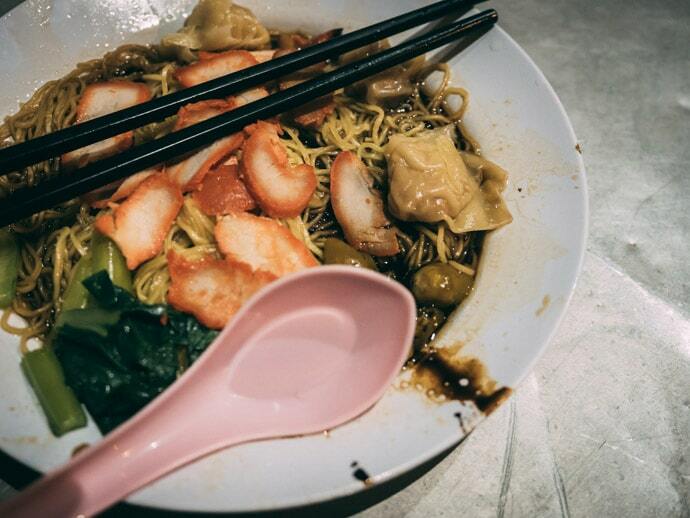 Wanton Mee is a noodle and dumpling dish with slices of pork, greens, pickled chilli and a broth-like sauce. To sit at the tables you had to buy a drink from the drinks lady that comes around. 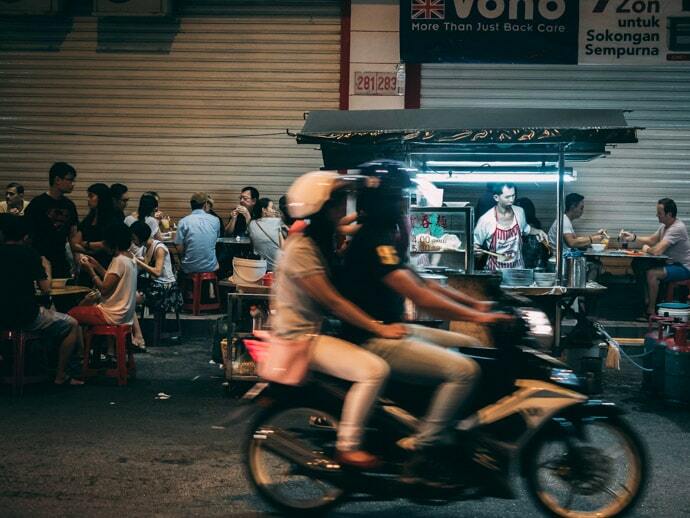 Our pick for where to eat in Penang at night for a local experience and atmosphere. 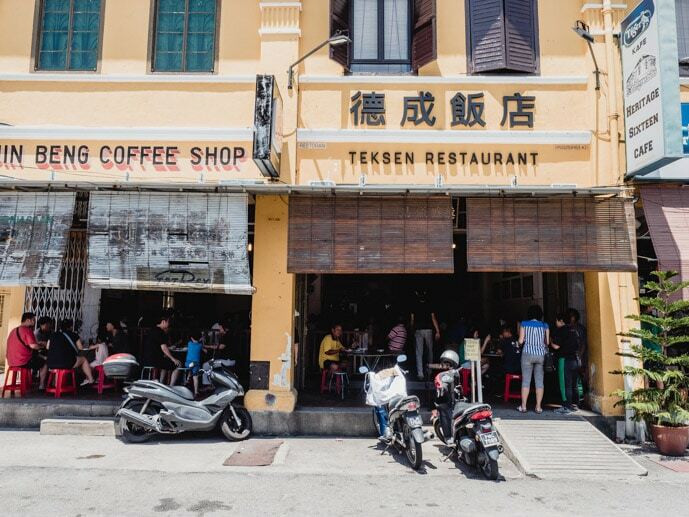 Tek Sen Restaurant is a Chinese restaurant in Penang, first opened in 1965. It’s extremely popular so I recommend getting there early if you can. 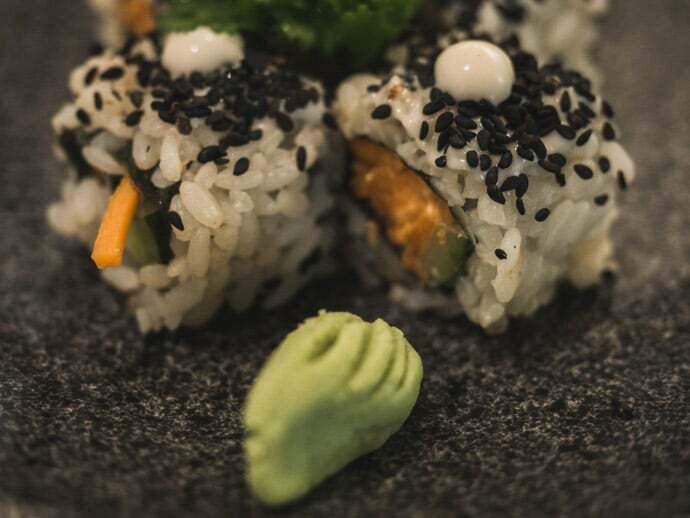 Even though it’s always busy and highly recommended, their food does live up to the hype. We loved the home recipe double roasted pork with chilli padi, which was little bits of sweet and sticky pork. We also loved the deep fried chicken with sour plum sauce. 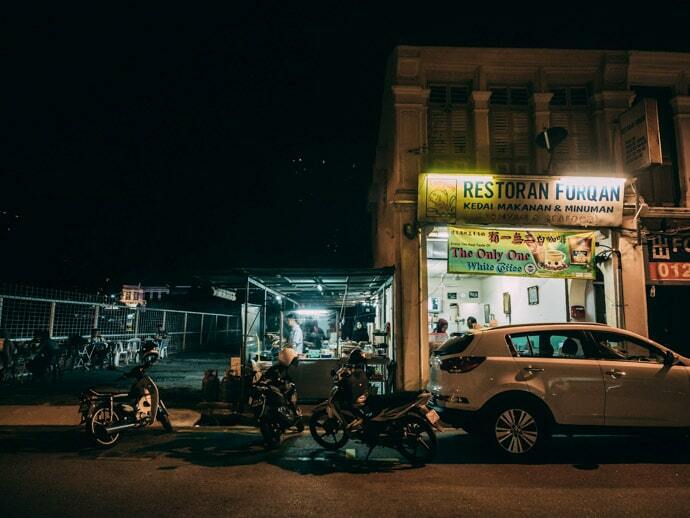 A great option for where to eat in Penang for dinner or lunch. You can see the Tek Sen menu here. 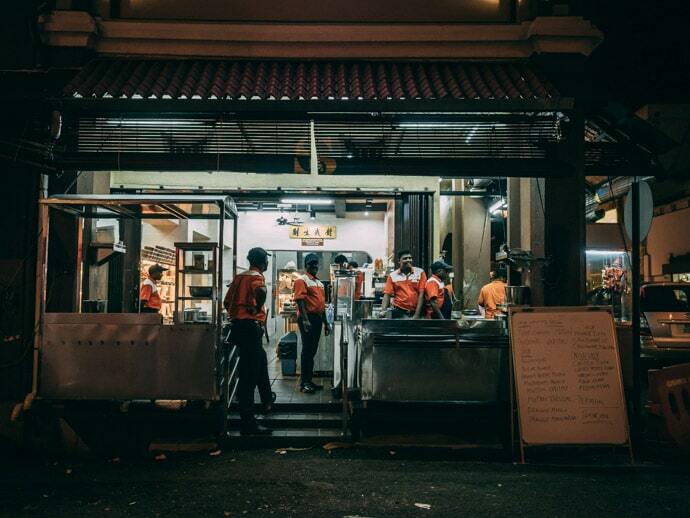 This was one of our go-to Indian Restaurants in Little India. Each day we would pass by on our way to our co-working space and it often became our dinner spot. 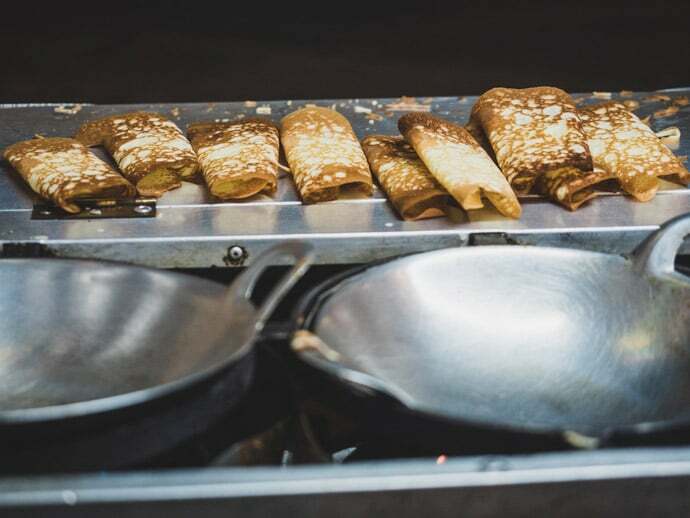 Some things are hit and miss, but some of our favourites include the delicious Tosai (otherwise known as Dosai, Dosa or Thosai), Chicken Tikka Masala, Naan, Puri (breakfast menu), samosa, murtabak, and iced masala tea. Here you just take a seat and they will come around and give you a menu and come back to take your order (you may need to try to get their attention but the staff are friendly). 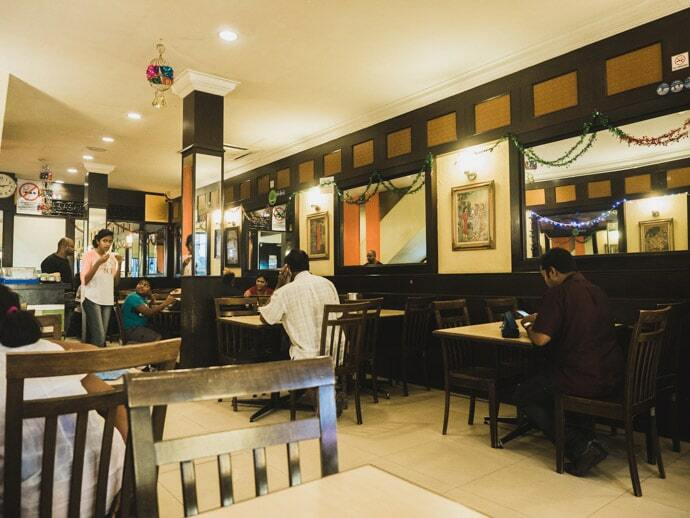 Another Indian restaurant in Little India, this one serving vegetarian food and has more of a restaurant feel. 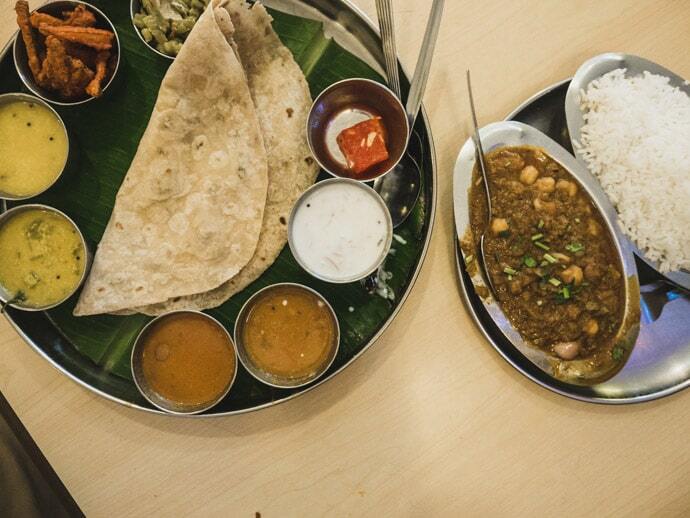 We loved the channa masala (chickpea masala curry) and chappathi set. Some things on the menu are only available for breakfast, lunch or dinner, so if something looks tasty take note of when it’s available and you can always return. 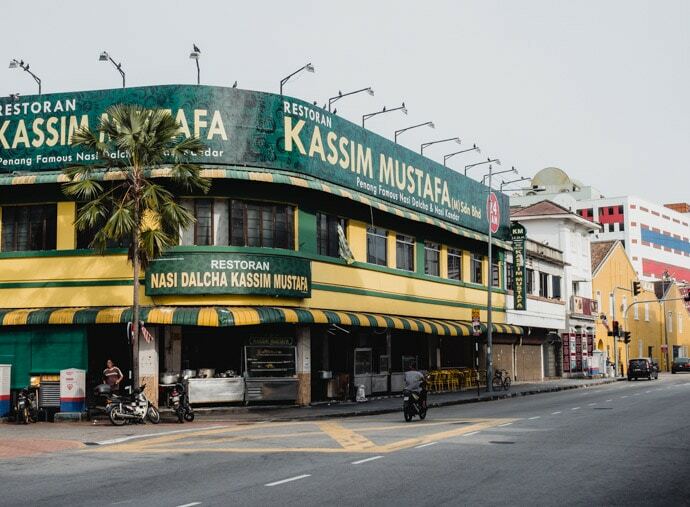 Although it wasn’t one of our favourites out of this list, we loved Restoran Kassim Mustafa for roti canai with curry for breakfast. 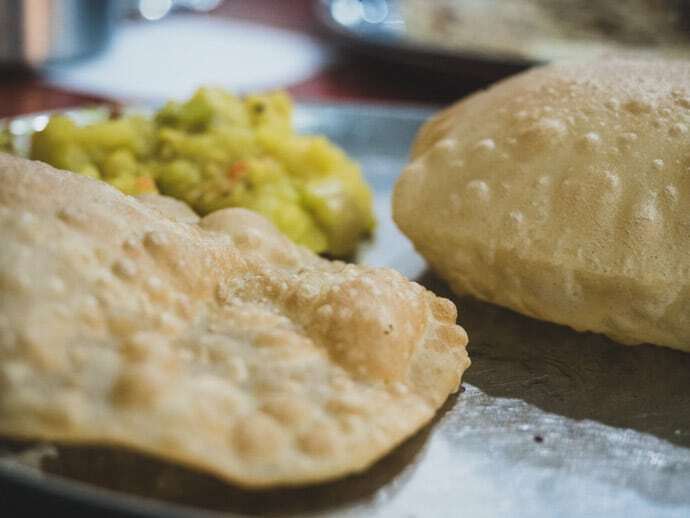 So if you feel like a roti for breakfast, this is a great place to come. As someone who could eat roti canai for breakfast, lunch and dinner, this was definitely a place we returned to. Having said that, it’s not the best roti I have ever had, but it’s just a nice simple breakfast. 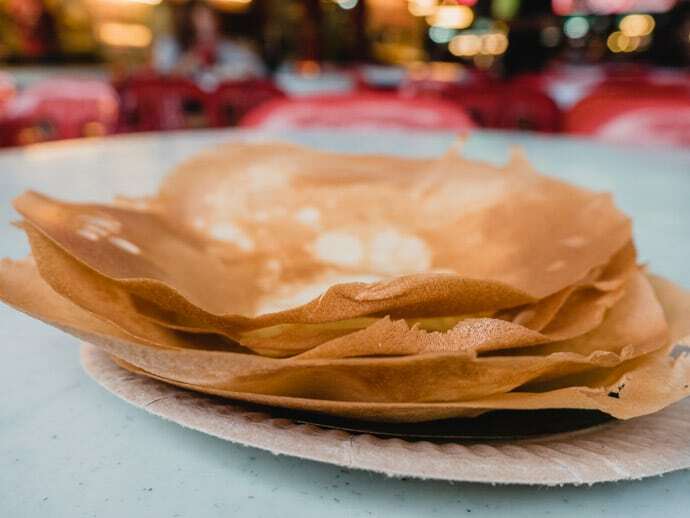 I had my first roti canai at a stall in Penang on our first trip here about 7 years ago and it made me an instant roti lover for life. Unfortunately, I don’t believe that stall is still there, and I haven’t found one that lives up to it in Penang yet. This is a delicious Thai food restaurant in Penang. But be prepared for extra spicy cuisine. We loved the super spicy Udang Tom Yam, which is a hot and sour soup with shrimp. This was packed full of flavour, but super spicy, so much so, I, unfortunately, reached my limits and Chris had to finish it off. But the flavours it left in my mouth made it all worth it. We also loved the Mangga salad (Green Mango Salad) which was also spicy. Highly recommend an Ice Milo or two to accompany your dishes to help with the heat. Or just because it’s ice milo. Obviously not local food, but I had to include Sushi Kitchen as we absolutely loved the inside-out sushi and noodle dishes here. So fresh and tasty, if you’re looking for something lighter then this is a delicious restaurant. It’s a vegetarian restaurant, but honestly, I think even meat lovers will enjoy. 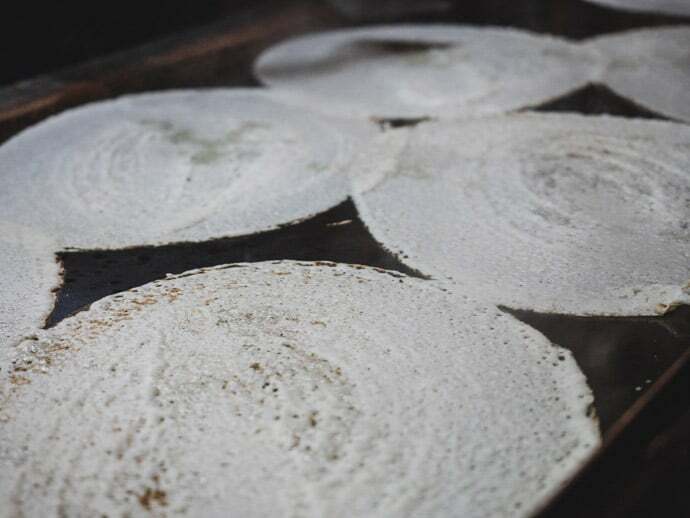 Apom is a deliciously simple coconut pancake that is thin and crispy around the edges and a little thicker and moist in the centre. 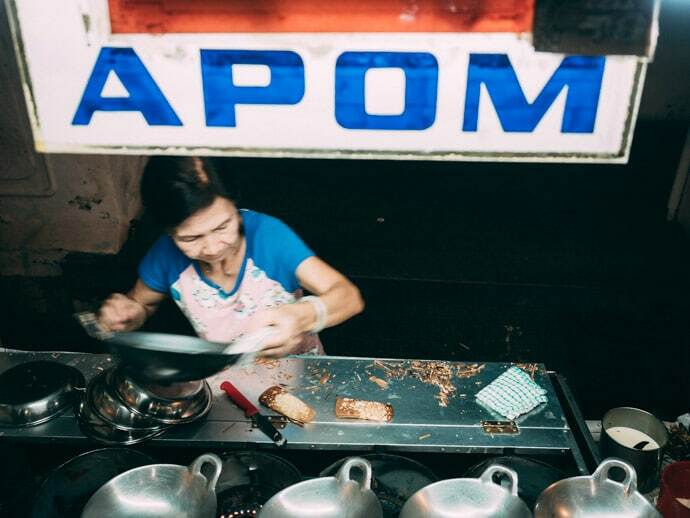 On Chulia Street Night Market you will find a little stand with a lady making apom. Not only are they delicious, but watching her process for making them is mesmerising. They are tiny and light so we always got about 10 to share, but I could have easily had so many more. It was very tempting to walk home past her apom stand most nights and not have these every night. Another Apom stall, this time in Red Garden Food Paradise. You can get a mixture of things in these ones, but I always go plain as they taste so good on their own. 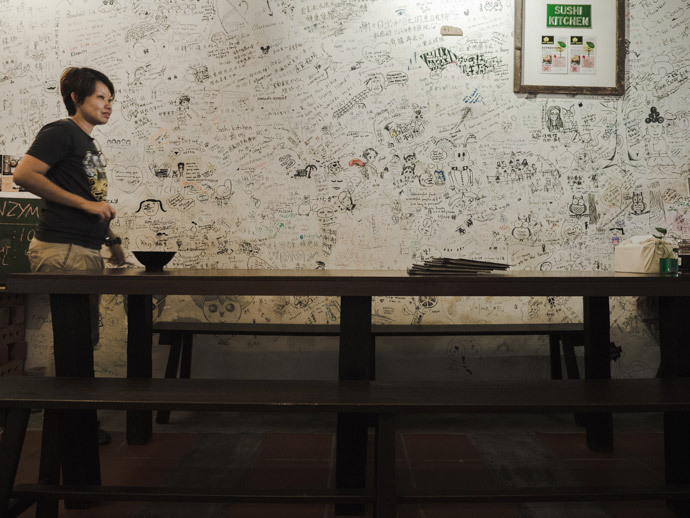 China House is a cafe located in a traditional heritage building. Although they serve food and drinks, the real drawcard here is their cake selection. Walk in and you will see a wall of cakes, it makes it really difficult to decide on just one. We had a Chocolate meringue cake and it was delicious. 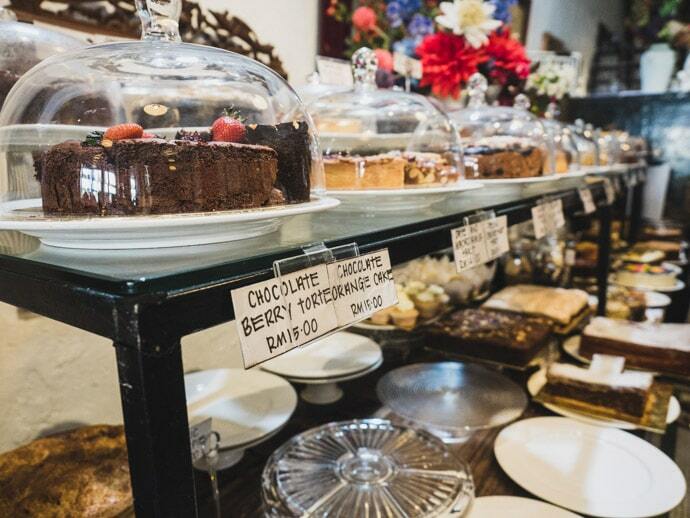 Our pick for where to eat in Penang for something sweet. Siam Road Charcoal Char Kway Teow from 3 pm. Penang Road Famous Teochew Chendol at Joo Hooi Cafe at 475, Jalan Penang, George Town. Ais Kacang Restoren Kek Seng on Jalan Penang, George Town. 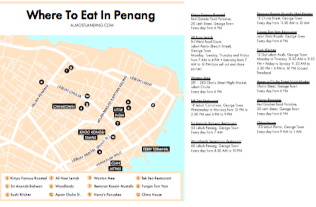 Get your free printable Where To Eat In Penang Map (PDF) to take with you. 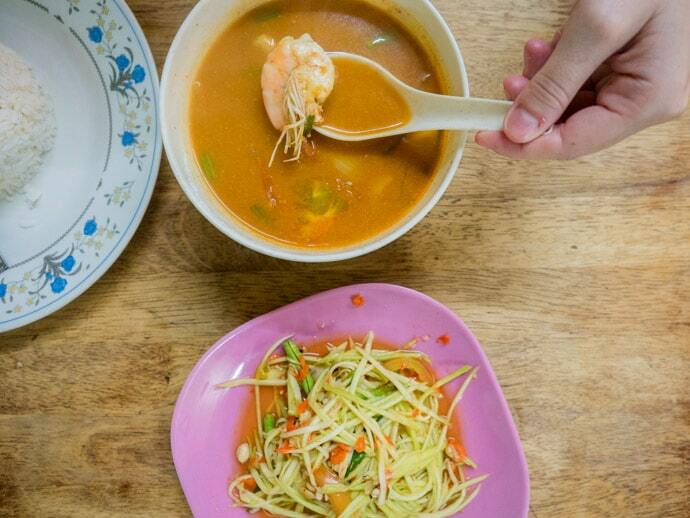 So that’s our favourite picks for where to eat in Penang… what’s your favourite?